I mainly Sharpen Knives and Cutlery for Home Cooks and Professional Restaurant Chefs as well as Professional Salon Scissors and Shears. I also Sharpen a variety of Indoor Tools and Garden Shears and Loppers. I DO NOT Sharpen Outside Equipment like Chainsaws, Lawn Mower Blades etc. 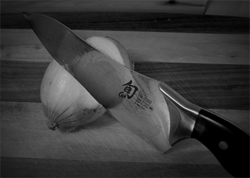 Knife Sharpening Prices for Standard Edge Profiles are generally straight forward, especially with Kitchen Knives and Cutlery that is in undamaged condition and need a good Sharp Edge put on them. If the Knives need to be reground, have nicks or chips and need a new Edge put on them, or Reshaping as well as other repairs, Please contact me ahead of time so no delays take place. There are exceptions to all things, and anything particular like bent tips, broken tips, knives that need the Bolster ground down are addressed and charged accordingly. If a Knife is extremely dull and needs thinning in order to get a usable edge, I will contact you once I see it and discuss the work involved and pricing. Generally, Smooth Edge Knife Sharpening Prices for Standard Kitchen Knife Sharpening is calculated at the rate of $1.50 per linear inch of Blade. Simply add up the amount of blade inches of your knives and calculate the total amount of inches by $1.50 for Standard edges.